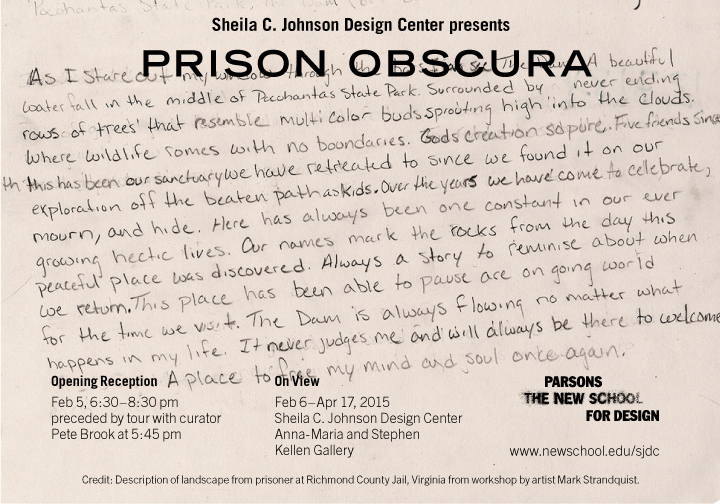 After stints at Haverford College, PA; Scripps, CA; and Rutgers, NJ, my first solo-curated effort Prison Obscura is all grown up and headed to New York. Specifically, it’s at the Sheila C. Johnson Design Center, located at 2 West 13th Street, New York, NY 10011. On Thursday, February 5th at 5:45 p.m, I’ll be doing a curator’s talk. The opening reception follows 6:30–8:30 p.m. It’d be great to see you there. The works in Prison Obscura vary from aerial views of prison complexes to intimate portraits of incarcerated individuals. Artist Josh Begley and musician Paul Rucker use imaging technology to depict the sheer size of the prison industrial complex, which houses 2.3 million Americans in more than 6000 prisons, jails and detention facilities at a cost of $70 billion per year; Steve Davis led workshops for incarcerated juvenile in Washington State to reveal their daily lives; Kristen S. Wilkins collaborates with female prisoners on portraits with the aim to compete against the mugshots used for both news and entertainment in mainstream media; Robert Gumpert presents a nine-year project pairing portraits and audio recordings of prisoners from San Francisco jails; Mark Strandquist uses imagery to provide a window into the histories, realities and desires of some incarcerated Americans; and Alyse Emdur illuminates moments of self-representations with collected portraits of prisoners and their families taken in prison visiting rooms as well as her own photographs of murals in situ on visiting room walls, and a mural by members of the Restorative Justice and Mural Arts Programs at the State Correctional Institution in Graterford, PA. Also, included are images presented as evidence during the landmark Brown v. Plata case, a class action lawsuit that which went all the way to the Supreme Court of the United States, where it was ruled that every prisoner in the California State prison system was suffering cruel and unusual punishment due to overcrowded facilities and the failure by the state to provide adequate physical and mental healthcare. A workshop led by Mark Strandquist. More information about participation will be available on the website. Please spread the word. Here’s a bunch of images for your use.